Image caption The traffic information centre described some routes in the Paris region as "catastrophic"
Heavy snow in Paris brought buses to a halt on Wednesday, suspended flights at Charles de Gaulle airport and prompted the closure of the Eiffel Tower. Motorways in the Paris region were described as impassable as snow that had already hit other areas of France spread to the capital. Elsewhere in Europe, a boy drowned in southern Spain when his father's car was swept into a flooded river. In Poland, a further three people died because of the extreme cold. The authorities there said 66 people had lost their lives since the severe wintry weather began in late November. The Meteo France service reported that one of its Paris weather stations had recorded 11cm (4.5in) of snow. 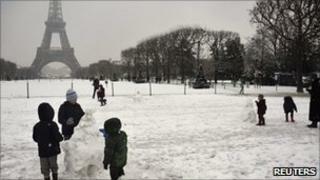 The French capital has not seen a larger one-day snowfall since 1987. Although the Paris Metro and rail network were operating normally on Wednesday, Charles de Gaulle airport closed for part of the afternoon until workers were able to clear the runways of snow. The operators of the Eiffel Tower decided to close the monument as salt could not be used to tackle the snow and ice because of possible damage to the iron structure. The national centre for traffic information described secondary routes in the Paris region as "catastrophic". By mid-afternoon, the bus operator RATP declared that not a single bus was running. Scottish Transport Minister Stewart Stevenson faced calls to stand down because of the government's handling of the appalling conditions that left hundreds of drivers stranded in their cars on Monday night. A large part of the M8 motorway between Scotland's two biggest cities, Edinburgh and Glasgow, was reopened on Wednesday afternoon, two days after ice and snow forced its closure. In Spain, police recovered the body of a nine-year-old boy from a river bank after the car he was in was hit by water overflowing from the River Alcudia near the southern town of Almodovar del Campo. His father and elder brother managed to escape the car and survived. Flooding has forced the authorities in Ecija in Andalucia to move 3,000 people from their homes after the River Genil burst its banks.